Welcome to the Missouri Bone and Joint Research Foundation, a not-for-profit organization whose mission is to improve health and well-being through advances in biotechnology and arthritis treatment. Through on-going research in the biomechanical research laboratory, we continually see areas for improvement in the treatment of arthritic joints. We evaluate the clinical results of the total joint replacement patients seen in the Missouri Bone and Joint Center, explore the physiology of ligaments and joints in human cadavers, and evaluate the effectiveness of new surgical techniques. We also conduct biomechanical research on orthopaedic implants and biomaterials from various manufacturers of orthopaedic materials, including Smith and Nephew, Inc. and Whiteside Biomechanics, Inc. 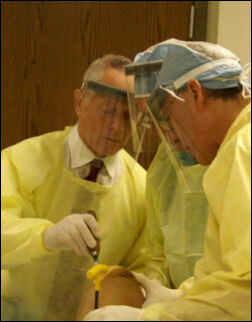 The results of our research are presented at numerous venues throughout the world, including annual meetings of the Orthopaedic Research Society and the American Academy of Orthopaedic Surgeons, national and international surgeon education meetings, and hands-on surgical skills courses held here in our facility at the Missouri Bone and Joint Research Foundation. We have the opportunity to help patients in all areas of the world as surgeons incorporate the successes of our efforts into their clinics.